Sam Hawke’s assured debut fantasy novel City of Lies starts intriguingly. Jovan, the narrator has been trained from a young age in the family trade of poison taster for the Chancellor of Silasta. He has been exposed to multiple poisons by his uncle as part of his training and has become partially immune to them as he learnt to identify them. He has been trained in the place of his elder sister Kalina whose constitution was too weak to handle the small amounts of poisoning. Despite this they are close and are both also close to Tain, heir to the Chancellorship. Their world is thrown into stunning and sudden disarray when both the Chancellor and their Uncle Ethan are poisoned with something neither Ethan nor Jovan can identify and their city is besieged. While City of Lies can be read by anyone it definitely has a young adult bent. While not teenagers, the main characters are all young adults, thrust into an adult world, learning quickly how to navigate treacherous political waters while dealing with a series of escalating crises. Their relative youth allows them to question the way things have been done traditionally (particularly as tradition has partially led to current events) and find new ways forward. But it also sometimes makes them easy prey for more experienced political operators. The narrative of City of Lies alternates between Jovan and Kalina. They have very similar narrative voices and in the early parts of the novel it is sometimes difficult to remember which character is narrating. It takes some time for their narrative voices to diverge but they do become distinct as the siege wears on and each has a very different role to play in events. 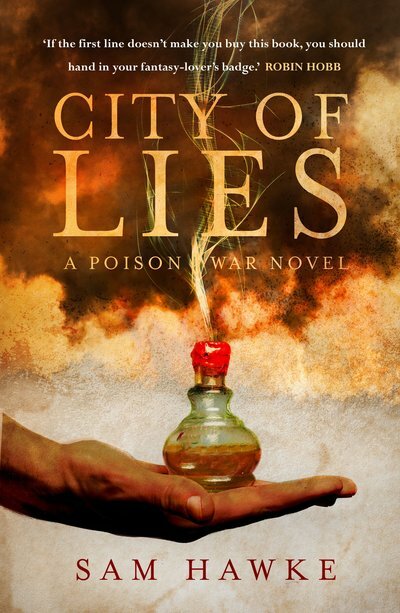 City of Lies is epic fantasy but its scope is restrained mainly to the capital city of one part of Hawke’s world. Other places and races are referred to but not explored in too much depth. And while it seems to have a local flavour, there are clearly some external machinations at play behind the events in this book although the shape of them is unclear. Given the book is marketed as Book 1 of the Poison War, presumably those machinations will eventually come to light. That said, City of Lies does tell a contained narrative but one which gives Hawke plenty of scope for exploring her world further and continuing this series.